While this species is commonly inhabits open areas with many nearby trees and shrubs, such as lawns, fields, and park, it can be found in a wide variety of habitats. 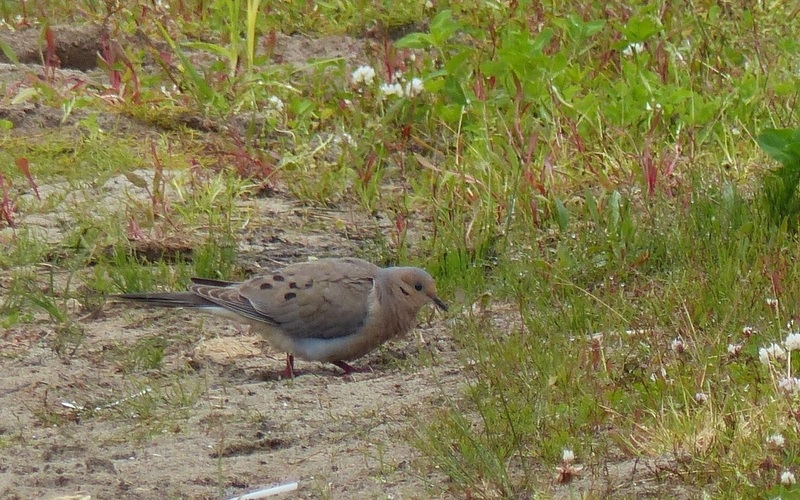 Normally an uncommon visitor to these northwestern latitudes, the mourning dove is a year-round resident as far north as Port Alberni on Vancouver Island. It breeds in interior areas of southern Canada and northern United States. It is a common and abundant bird within its range. The Eurasian collared-dove (Streptopila decaocto), also an uncommon visitor, has a black collar mark on the back of its neck and lacks the mourning dove's black wing spots. The rock pigeon (Columba livia) and the band-tailed pigeon (Patagioenas fasciata) are more commonly found on the Central Coast: they are larger and darker in colour. The mourning dove is the most commonly hunted species in North America. It is a fast flier. Dunn, J. L. and Alderfer, J. (Eds.). (2011). National Geographic Field Guide to the Birds of North America. (6th Ed.). Washington, D.C.: National Geographic Society. Pp. 266-267. Mourning Dove. The Birds of North America Online (A. Poole, Ed.). Ithaca: Cornell Lab of Ornithology. Retrieved from the Birds of North America Online. Accessed 15/10/2014. Mourning Dove Zenaida macroura. Audubon Birds. National Audubon Society. Accessed 15/10/2014. Kelly Fretwell, Misha Warbanski, and Brian Starzomski (2014).